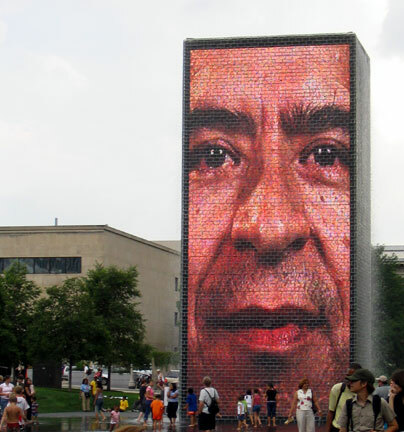 Anish Kapoor and Jaume Plensa rethink public sculpture for a media-rich age. Millennium Park both engages traditional urban ideas and inverts them in ways that are startlingly original. 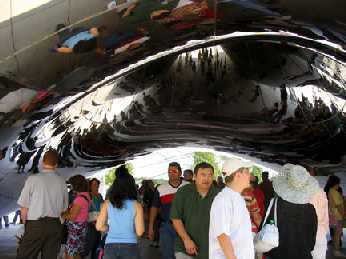 The blurring of the line between sculpture and architecture is found, not just in the billowing, stainless-steel proscenium of Frank Gehry's Pritzker music pavilion but in Anish Kapoor's Cloud Gate (now "Da Bean," in Chicago parlance) and Jaume Plensa's Crown Fountain. In our fast-paced, technology-rich age, just as new composite materials are being created that are unprecedented in both strength and lightness, traditionally segregated disciplines of art and design are fusing into new hybrids of escalating sensual intensity. 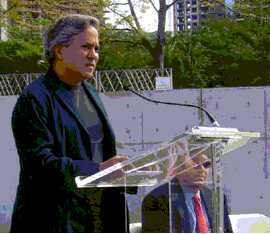 On Friday July 23rd, Gehry, Plensa, Kapoor and Kathryn Gustafson, designer of the Lurie Garden, all flew in to Chicago to attend opening ceremonies and participate in The Architecture and Design Society of the Art Institute's day-long series of three symposia - on landscape, sculpture and architecture. 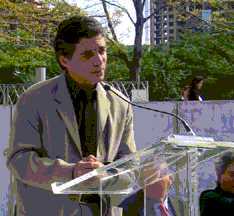 At the symposium on sculpture, Kapoor declared that "Public sculpture is a problem. For far too long, it seems to me, since the 19th century, there's been a loss of purpose - what is this object doing out there?" 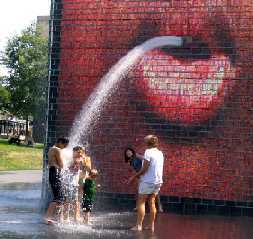 Plensa conceived the Crown Fountain not as an object, but as an environment. "I was dreaming to walk on the water. That is probably because I don't swim. I was always dreaming . . . to find that right sea for me, and that corner was the right sea for me, Monroe and Michigan. It's not a pool, just a very thin skin of water. . I think cities more and more need spaces where people can do everything that they like, and on the water, it seems that everything is possible. Just to go back to the origin of life. The Greeks said water was the true symbol of transformation." worked very hard," explains Plensa, "on the idea that all of us, we have two sides . . . the daylight side, and the freak side. We are freaks, also. And those huge faces, the gargoyles become these grotesque parts of ourselves, but that is also the most beautiful part of art, when we are out of control. When they spout water from their mouth, they are giving us life, and that is very beautiful for me." Kapoor takes a very different path to interactivity, one that's as much about disappearance as presence. 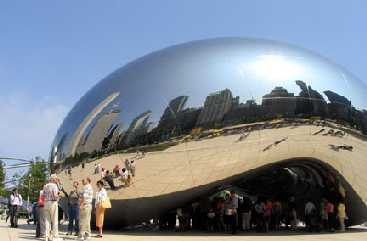 "In a way," he says of Cloud Gate, "it's also a kind of hole in the space, a non-object. An attempt to make physical the non-physical. Perhaps the history of sculpture is the history of matter, and the sense that I have of the making of objects, of the use of matter, is towards non-matter, where here a 110-ton structure object is light, is not present." So, what the hell is he talking about? 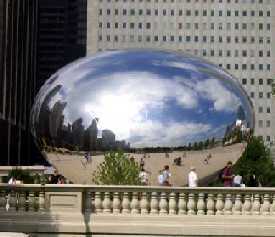 Well, Cloud Gate is a huge, amoeba-shaped sculpture with a surface of highly-reflective stainless steel. It's placed in the middle of raised terrace to form part of a vista where its huge bulk displaces the central portion of the actual view with funhouse mirror reflections of the view opposite that vista, the view occupied by the spectator. "The modern sublime is one that includes the viewer," says Kapoor. The massive size of Cloud Gate awes the spectator even as it dissolves in the images it reflects. You look at it, but see yourself. As you walk into and under it, it becomes a very architectural space. "When I arrived off the plane from London," says Kapoor, "I went straight down to the sculpture with my family, and it was great to be in there, watch people walk in and then leave and go, "Wow." Of course, there is that sense of a kind of immediate thrill, but one hopes that that also turns into something serious." Ultimately, however, a work of art must stand on its own, apart from the artist's explanations and intentions. While the crowds circling Cloud Gate at times appear some unsettled as to what to make of it, the predominant response, attested to by the coating of oily fingerprints on its underside, is one of shear consumerist delight, as it is at the Crown Fountain, where beaming parents watch their kids pacing through the pool and screaming in delight as they're drenched by the spouting video gargoyles. The ultimate question about these works is in the relationship of technology to modern life. An infinite selection of images, texts and ideas are at our fingerprints. Is it a revelation, or a numbing distraction from tackling the fundamental questions posed by human existence? Those old, unchanging stone sculptures Plensa talks about have been able to engage human imagination for half a millennia. We don't expect them to change - each successive generation finds new meaning in their form. When you go electronic and interactive, do you become fashion's slave? 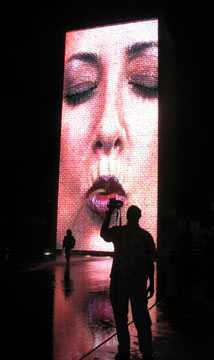 How long until people get bored with the giant LED faces and demand a new sensation, and what eternal truths will we derive from the churn?